 Wild Red Raspberry (Rubus idaeus) - Berries are red; stems covered with fine prickles. Photographs: 74 photographs available, of which 4 are featured on this page. SCROLL DOWN FOR PHOTOGRAPHS. The delicious edible black fruits that give Black Raspberry its name. Notive that the unripe fruits are red! 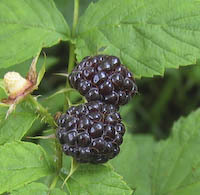 The stems of Black Raspberry are relatievly thorn-free, and are very glaucous, as shown here. The stems arch over and often root at the tip.